Bobby Critselous and his family love dogs. Some of his favorite memories center around watching his children and dogs grow up together and family outings to a local dog bakery. 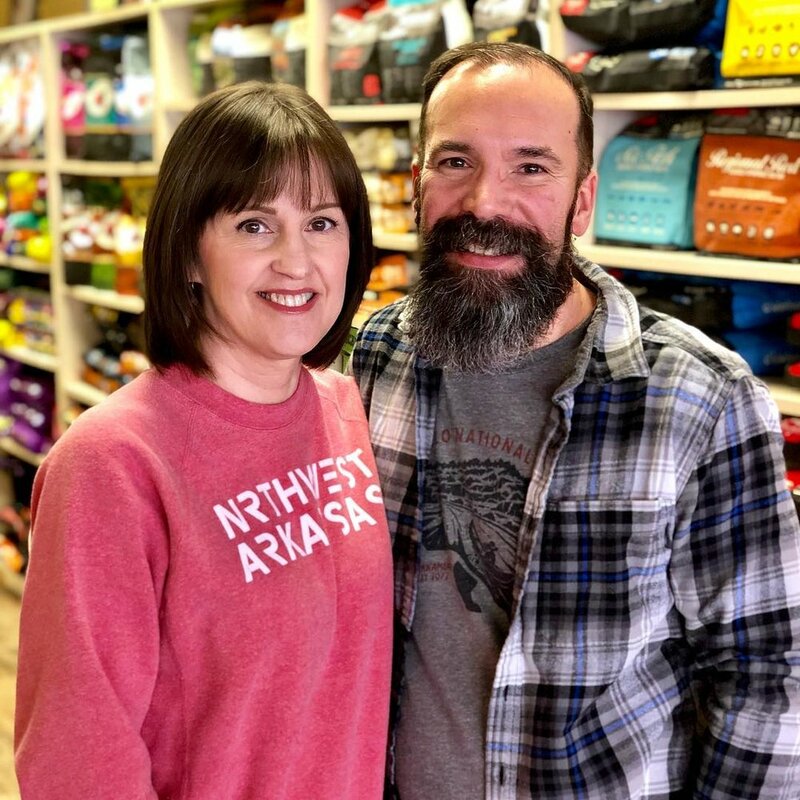 Wanting to share their cherished furry-friend experiences with the Northwest Arkansas, Bobby and his wife decided to open their own Three Dog Bakery location in Bentonville in 2015. Three Dog Bakery carries all-natural, high quality dog treats and accessories. But when you visit Three Dog Bakery, Bobby wants to make sure the quality of your experience is just as high as the quality of his products. Can you tell me a little about Three Dog Bakery? “Sure. So what is unusual and surprises a lot of people is that we are a franchise. But, it's a relatively young, maturing franchise that provides us a lot of autonomy to blend into our community. The most unique portion of our model and really what shapes and molds our store is more about the experience with owners and their dogs in our store. What does that “experience” look like at your store? “What that looks like is an everyday offering of pastries in a refrigerated case and in a warm case. We don't use artificial food coloring. We don't use granular sugars, and we don't use salts. We try to keep it all all-natural and fresh, and so we try to align with products that are like that as well. The experience I'm speaking of is the ability to bring your dog in and let its nose press up against the pastry case, just like you as a kid would go to Dunkin’ Donuts and put your fingers on the glass pointing at the donuts that you want your parents or grandparents to get you. It's just a good environment. I think it really provides a sense of community and relevance for pets, more so than getting out of a car, going in a square box and squeezing through aisles and aisles of merchandise. We caught criticism because people would say, man you could put another shelf here or why don’t you carry this product. That would probably one, require more overlap with another large store format where we're not going to win that game and two, it really clogs up lanes where you can't let your dogs in come in. How did you get involved in this in the first place? “I was actually in investment banking on an equity trading desk, and we lived in the outskirts of Memphis, Tennessee in Germantown. There was a Three Dog Bakery in Collierville, one of the neighboring cities, that our kids and our dogs that we would go to. In 2014 you know I made a career change. Our kids were starting at University of Arkansas, so we decided to come up here. We wanted to try to find something that could occupy our time and let us live a little bit more settled and stable life. Do you taste test all the treats you make? “We use all human-grade ingredients. We don't cook with animal fats. We don't cook with animal proteins in what we make here in the bakery. And, instead of granular sugars, we substitute molasses or applesauce or honey as a natural sweetener, so they would taste more like a tea cake rather than a sugar cookie or something of that sort. In the cold case, items that look like regular pieces of cakes—what we call pupcakes rather than cupcakes—have the appearance of just what you would see at any other bakery, just without the confectioners sugars. Sometimes the texture is a little bit firmer or more like a roll rather than a sponge cake, but the taste of them are really as a human relative to that is kind of nonplussed. You don't spit it out, but it's kind of bland. But the ones that are made like cookies, we actually have some options that are right there with a vanilla Oreo or something similar. I don’t know if you've been aware of the recent movement a lot of the shelters have adapted, the dog biscuit challenge. It’s a different fundraising model like the ice bucket challenge for ALS. To raise awareness and to raise, they'll challenge people to either eat a dog biscuit or donate to their animal rescue and then pass that challenge on with a video. Who better to cater to your four-legged BFF than fellow fur-lovers? Make your way over to Three Dog Bakery with your pup by your side and Towny in hand. Towny is the easy way to explore local Northwest Arkansas businesses (+ earn perks for shopping at them!). You can browse Towny online or download the app to your phone.